On Kindle: Super Bad Hair Day & The Poet and the Supersplainer! Series 1963 A anthology: The Dimensional Dollar! Carry The Light 2016: The Malevolent Mystery Meat! Scripting Change 2016: The Terror of the Twisted Tonguester! Fault Zone 2016: The Sinister Soul Surfer! Carry The Light 2015: part of Chapter Zero of Fanboys Shrugged! Scripting Change 2014: The Wicked Word Witch! Scripting Change 2013: Handicapped Bodies, Super Hearts! Chapter Zero of The Comic Book Code! Excerpt from Kittygirl in The Fiendish Brain Freezer! A decent first draft: Death by Lutefisk! Music! Poetry! Prose! And maybe cupcakes! Tina Gibson, local author and poet and karate master (I know, she showed me) will host local authors at the Main Gallery, 1018 Main Street, Redwood City, CA. Each author gets about 20 minutes or so to read their work. I’ll either perform The Intellecta Rhapsody or some superpowered fights from my Super Bad Hair Day book. Super Holly Hansson might get new fans! P.S.There will be light refreshments. I will bring some cupcakes that my cousin’s wife baked. I hope they will turn out okay, I put them in an airtight container which I put in the fridge. 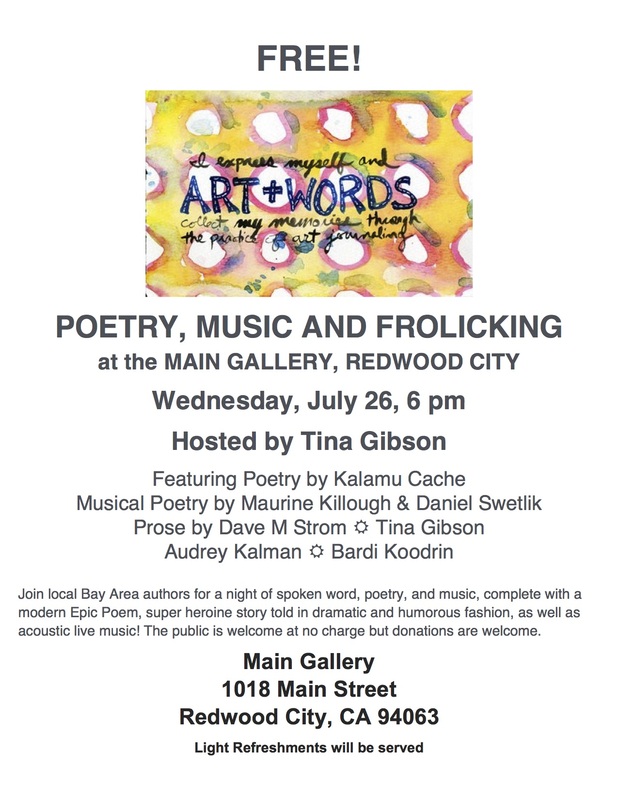 This entry was posted in Uncategorized and tagged author, live music, Main Gallery, music, poet, poetry, Redwood City, spoken word, Super Holly, Super Holly Hansson, Tina Gibson, writer, writing by davemstrom. Bookmark the permalink.